The eye of the camera is a window into the filmmaker’s soul. What you’re seeing is Mr. Jackson’s soul, as it experienced Lord of the Rings. He saw the mountains like his home of New Zealand, the Orcs like creatures brewed in the ground mixed with the warrior prowess of the Maori, and the captivating beauty of the land of the elves like the hidden paradises around which he grew up. Boromir is currently the coward in this scene. He gets a basic CU (close-up), which is traditionally from the mid-chest to the top of the head. Legolas on the other hand is defending his honor, showing that he is honorable and the one to pay attention to of the pair. He gets a closer CU. He probably also gets that because someone thought he was prettier. Well, he was cast as the Elf. Do you see how Mr. Jackson is showing you his soul? He shot The Fellowship of the Ring in a specific way so that you would feel the same way he feels about everyone and everything on screen. But he didn’t just do it in a basic, boring, lets-cover-all-the-angles way. He created something gorgeous. CineBeauty – the act of using a video camera to create something beautiful. Even hideous, creepy, evil things are somehow beautiful as seen through the eyes of filmmakers like Jackson. There are so many things in the cinematography of the Fellowship of the Ring that are beautiful. And I haven’t even seen it in years. We could talk about the use of lighting to convey good vs. evil. We could talk about hero shots and sweeping angles and maximizing tension and showing the connectedness of a team…but this is just a post scratching the surface of beauty and the soul of the filmmaker. What is CineBeauty to you? What other movies and filmmakers create gorgeous visuals to tell their stories? Go watch a movie and find out. I’m in the process of developing a webseries. It’s a comedy about a group of friends who decide to break social norms by doing crazy things in public. It’s called, Things We Do In Public. These are self-proclaimed nerds, of course. A moment ago I searched Youtube for The Lord of the Rings soundtrack, for a completely different reason. The ad that popped up beside it and on it was for a geek dating website. Now why am I considered a geek if I look up The Lord of the Rings? I might just like epic music. Or maybe I’m researching influential American authors. Or maybe I need background music for a sword fight I’m choreographing for a kids’ drama class. It’s one of those reasons anyway. 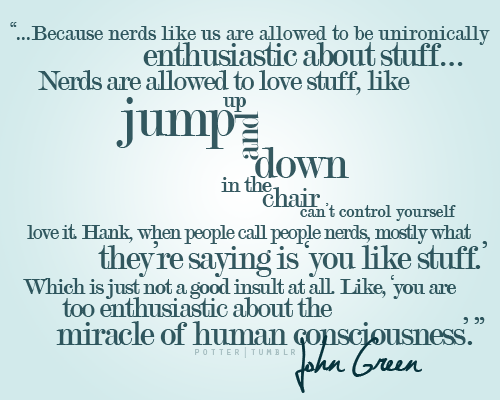 A person with an eccentric devotion to a particular interest: “a computer geek”. Suddenly because I like LOTR I am socially inept and/or eccentric. Now, I know that the second one may be true. I am a film/theater lover. 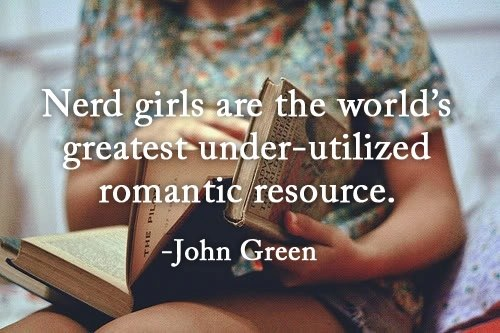 But I always think of myself as a nerd, not a geek. A foolish or contemptible person who lacks social skills or is boringly studious: “one of those nerds who never asked a girl to dance”. This is the kind of people who will live in my webseries. These are real people. The google definition is just a reflection of insecure highschoolers who needed a category for all the people who made it through chemistry on the first try. With an A.
I’m definitely the kind of person who choreographs sword fights.